Asian Fashion Blog: so you wanna model for an Asian magazine? I came across this on facebook and thought I'd share it with you all! I know there are a lot of aspiring asian models out there, looking for their big break. There's no height restrictions, but they are only accepting models aged 18 or over, and you don't even have to be asian - you just have to look it! I know very little about modelling, so can't advise on what to expect at the casting, but if modelling is your dream this casting session looks legitimate, so ring up for more info, go along, and see if you can make your dreams come true! 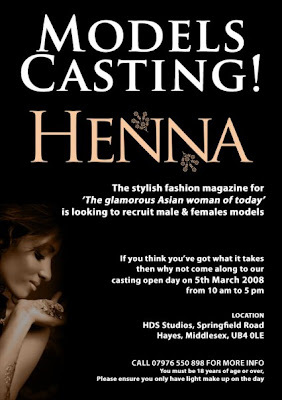 The casting is in London on Wednesday 5th March, 10am - 5pm. For more info, click here to check out the facebook event. i always wanted to do modelling!! !